“RBG” is a documentary love letter to Supreme Court Justice Ruth Bader Ginsburg, and it assumes you love her too. For audiences who only know her as a T-shirt, an ironic rap-inflected signifier — the “Notorious RBG” — or the hip judicial granny gently spoofed by Kate McKinnon on “Saturday Night Live,” the movie by Julie Cohen and Betsy West will come as a welcome deep dive into the actual Ginsburg’s historic accomplishments and ongoing legacy. But it says something that the woman herself remains quietly and stubbornly unknowable, despite the film’s sometimes hagiographic (and quite understandable) overreach. A lot of people want to make Ruth Bader Ginsburg a rock star — indeed, that may be the only way a culture addicted to entertainment can understand her — but, thankfully, she lacks the outsize charisma and need for the spotlight. Instead, Ginsburg possesses something far more important: a groundbreaking legal mind. Justice Ruth Bader Ginsburg and President Carter. Using a combination of archival sifting and interviews with friends, family, and associates — and with generous amounts of sit-down time with the lady herself — “RBG” assembles a portrait of a decorous, studious Brooklyn girl, the daughter of Jewish immigrants, who learned two lessons from her beloved mother: be a lady and be independent. In carving inroads into the male citadels of Harvard and Columbia Law schools during the 1950s, Ginsburg let hard work define her; if the dean of Harvard Law was going to tell her that she was taking a space from a deserving man, her response was to simply become more deserving. 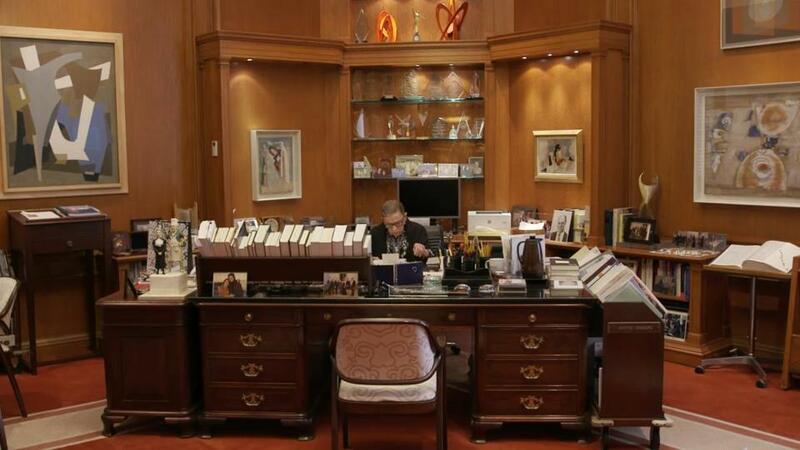 A scene from the 2018 documentary film "RBG." That Ginsburg was named to the Harvard Law Review during her second year while raising two small children while caring for her husband, Martin, during his successful early battle with cancer while keeping him up to speed on his missed lectures while maintaining her own studies underscores the awe onlookers then and now have felt for her. (It also explains her night-owl tendencies.) “RBG” quickens its stride as it leads the audience through Ginsburg’s work with the ACLU during the 1970s and 1980s, successfully challenging and overturning discriminatory gender-based laws in cases like Frontiero v. Richardson (1973) and Duren v. Missouri (1979). 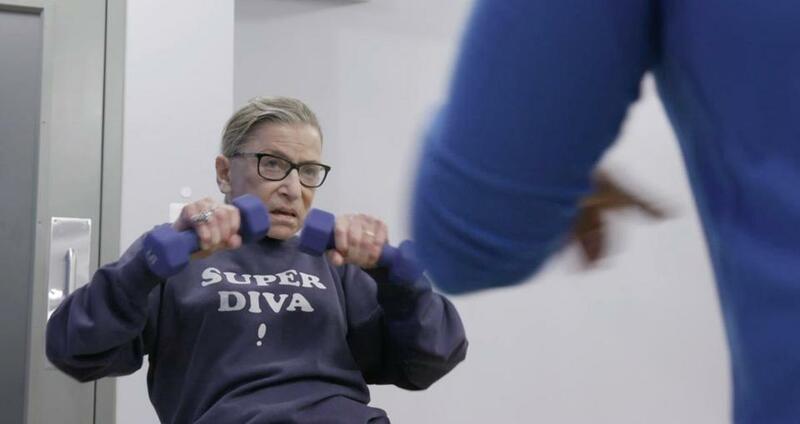 Justice Ginsburg mid-workout in the documentary "RBG." In Weinberger v. Wiesenfeld (1975), Ginsburg cleverly exposed the absurdity of existing statutes by representing a widowed father, Stephen Wiesenfeld, who had been denied state benefits granted to surviving mothers. Other interviewees speak glowingly of her knack for long-range strategizing and laying traps of simple, inescapable logic. Ginsburg herself just smiles like the cat who has seen it all. Her stated philosophy: Take cases that make good laws. 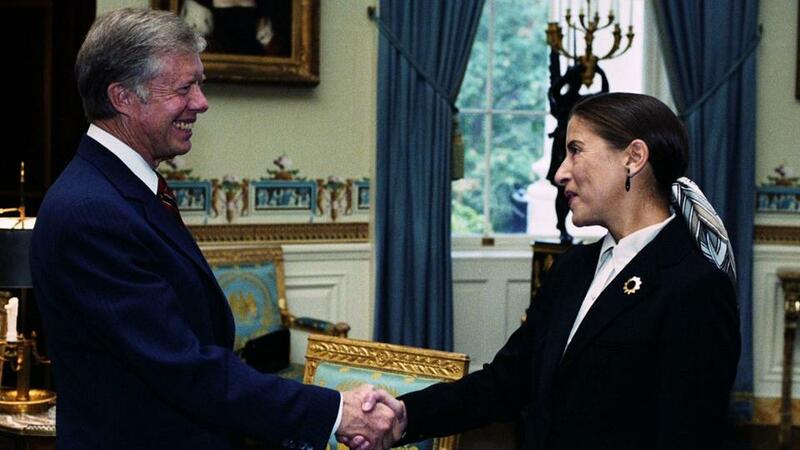 She was named to the Supreme Court in 1993 by President Clinton and confirmed by a vote of 96 to 3 — remember those days? Similarly, “RBG” extols Ginsburg’s fond, genuine friendship with the late conservative Justice Antonin Scalia — they shared an abiding love of opera, among other things — as proof of her resistance to partisanship. 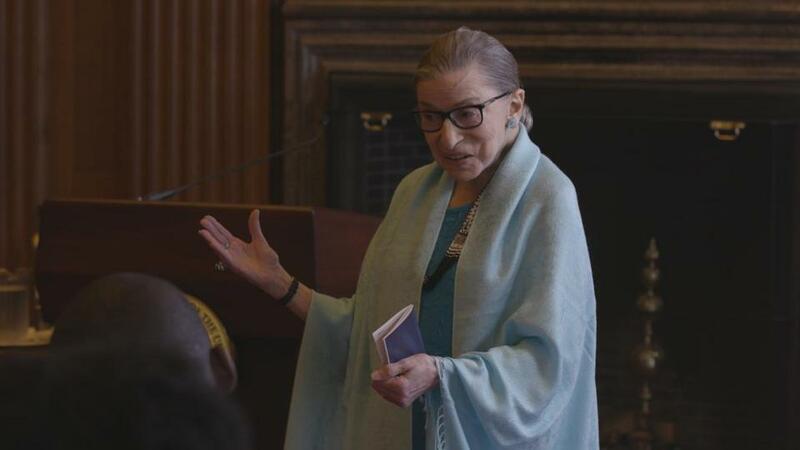 But the film also notes how her position on the court has slowly shifted from center left to far left as the rest of the bench has moved right, and it lionizes, as it should, the finely argued and legally excoriating dissents Ginsburg has authored in more recent cases like Citizens United v. FEC and Burwell v. Hobby Lobby. 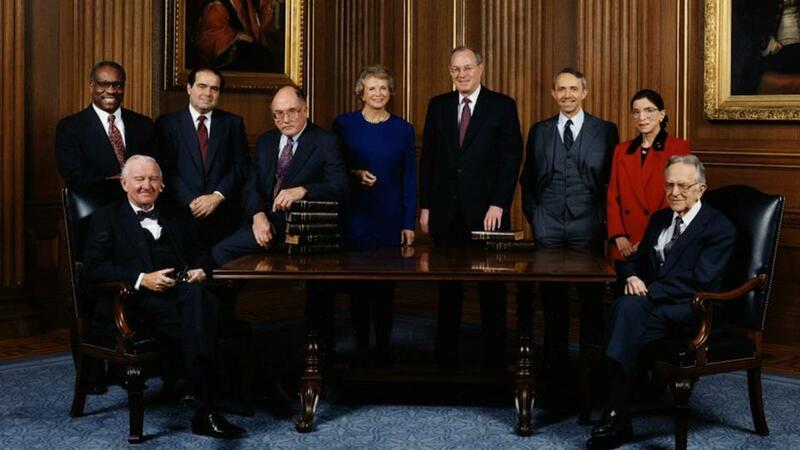 The Supreme Court justices in 1993. In person, she comes across as both shyer and slyer than the cherished cartoon of her public image, and the film’s good cheer slips only once, when Ginsburg’s grown daughter, Jane — herself a Columbia law professor — is asked to describe her mother as a mother. After some thought, she says one word: “Exigent.” It means urgent, pressing, demanding — not the nostalgic posy some might wish for but evidence of a pricklier and more interesting Ruth Bader Ginsburg than this documentary dares to entertain. The filmmakers apparently believe there will be time for warts and all later. They may be right. Directed by Julie Cohen and Betsy West. Starring Ruth Bader Ginsburg. At Boston Common, Coolidge Corner, Kendall Square. 97 minutes. PG (Some thematic elements and language).